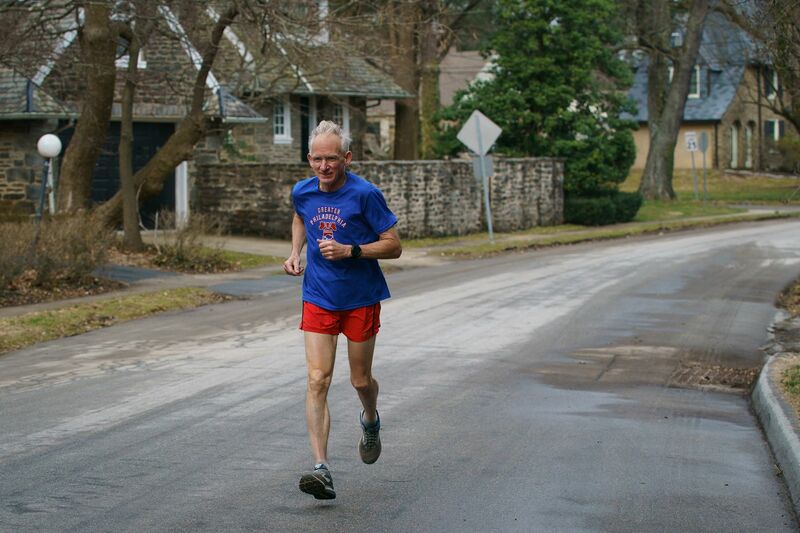 Gene Dykes, 71, trained for the Boston Marathon near his home in Bala Cynwyd. Gene Dykes, 71, of Bala Cynwyd, broke his own age-group record in the Boston Marathon on Monday, posting the fastest course time for a 70-to-74-year-old at 2 hours, 58 minutes, 50 seconds. In a dramatic finish Monday, Lawrence Cherono of Kenya was the overall winner in the men’s division with a time of 2:07:57, two seconds ahead of Ethiopia’s Lelisa Desisa. Worknesh Degefa of Ethopia was the fastest woman at 2:23:31. Dykes, who jokingly calls himself the “Ultrageezer," has run marathons even faster than his latest time in Boston. In December, he ran the Jacksonville Marathon in 2:54:23, which would have been a world record for his age group except the course was not sanctioned by USA Track and Field. Dykes followed no special diet while training for Boston, other than cutting out ice cream to lose a pound or two from his 5-foot-10, 142-pound frame. Weather forecasters had predicted rain and wind during Monday’s race, but the foul weather faded and there was even a hint of sun. In an interview last month, Dykes said he was happy to run in any conditions. “I’ll run when it’s hot, cold, windy, arid, rainy — it doesn’t matter to me,” he said. “There’s no bad weather, only bad equipment." Dykes was joined in the race by daughter Hilary Shirazi, a software executive, who did pretty well herself, running a 3:28. She posted a pre-race photo with her father on Twitter. The course in Boston is not eligible for national or world records, as it is laid out from point to point with a net drop of several hundred feet in elevation. Record-eligible courses must start and stop at the same point. Nevertheless, the course is considered difficult. That is partly due to a series of hills in Newton, near the end, culminating with the 0.4-mile Heartbreak Hill. Though not the longest or steepest hill in marathon racing, Heartbreak comes after the 20-mile mark, when many entrants are dragging. Dykes’ time on Monday works out to an average pace of 6 minutes and 49 seconds per mile. Dykes was on the track team in high school and college, but mostly gave up running after that until age 56. Since then, he has run more than 100 marathons and ultramarathons, some of which were longer than 200 miles.